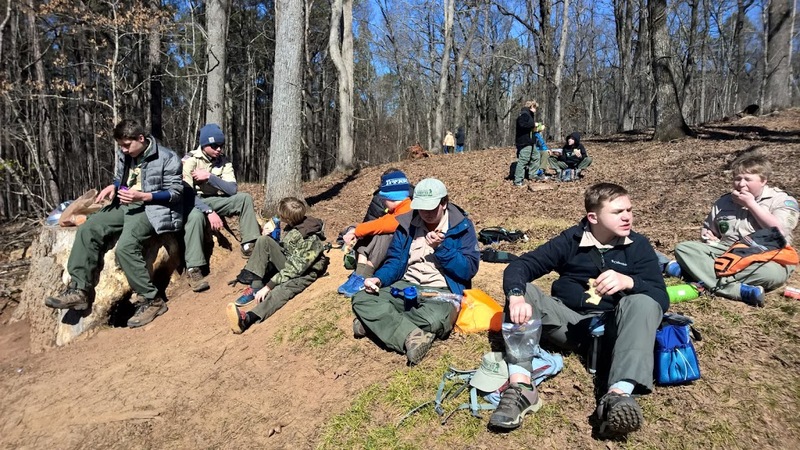 Last weekend, the troop's campout in Georgia proved to be a test of endurance, both in hiking and the weather. We stayed two nights at the Red Top Mountain State Park, north of Atlanta, with temperatures in the 20s. 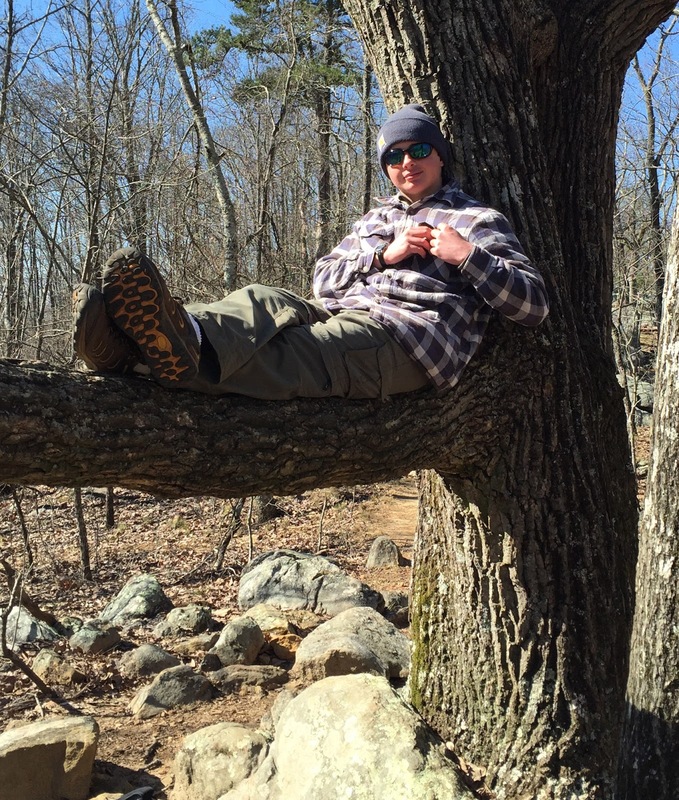 On Saturday, we hiked twelve miles at the Kennesaw Mountain National Battlefield Park, where the temperature barely reached 40 degrees. However, the scouts and adult leaders persevered in the face of cold weather and long miles to enjoy a weekend of fellowship and a chance to learn about Civil War history (at least the scoutmaster enjoyed that part). The bundled up scouts and leaders prepare to hit the trail at Kennesaw Mountain. We departed Auburn on Friday evening and headed through Atlanta traffic to Red Top Mountain, which is about thirty miles north of I-285. Our campsite was in the Pioneer Campground at the park, which boasts a nice pavilion with picnic tables, trash cans, fire ring, and latrines. It normally has a water spigot as well but the recent cold had split the pipe and the water was shut off. Fortunately, the park management had alerted us to this earlier in the week and we came prepared with water jugs filled. With the temperature beginning to drop, the scouts quickly got their tents set up and personal gear arranged. Although everyone hit their tents fairly early in the evening, the amount of conversation between scouts continued much longer into the night. Even with a morning temperature of 27 degrees, everyone was up and about by 7:00 eastern time. A couple of propane heaters helped to take the edge off the cold as we prepared breakfast. The heaters also served as part of an experiment to find a novel way of heating pop tarts. No word yet as to whether the idea can be patented. 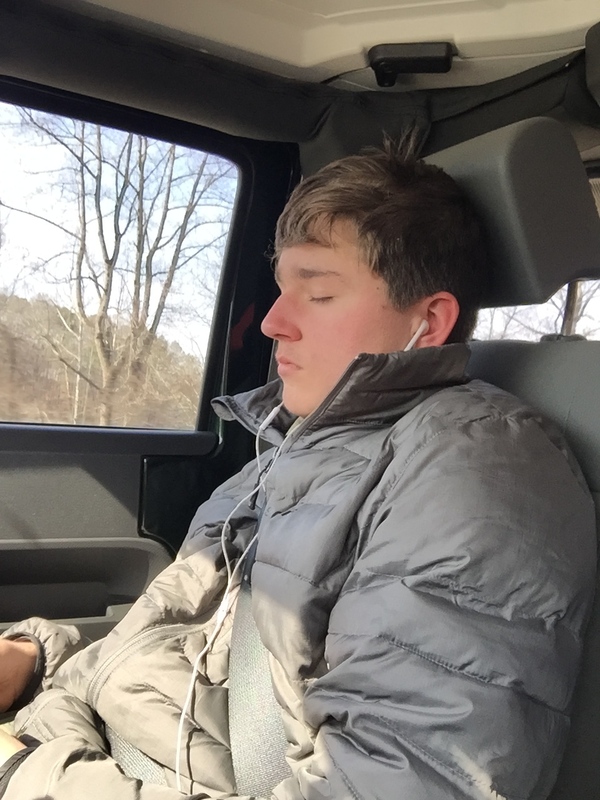 After securing the campsite and troop trailer, we were back in the vehicles for the short trip down to Kennesaw Mountain. The battle of Kennesaw Mountain took place during the fourth summer of the Civil War in 1864. The Union forces under the command of General William Tecumseh Sherman were advancing through north Georgia with the goal of capturing Atlanta. They were contested by the Confederate Army of Tennessee, under the command of General Joseph Johnston. 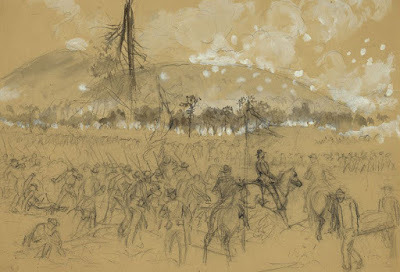 Although Sherman had much success at flanking Johnston out of position through north Georgia, when confronted by the Confederates at Kennesaw Mountain, Sherman decided on a frontal attack against the entrenched Army of Tennessee. He believed that the Confederates had stretched their defensive lines too thin and would be easier to overcome. This poor decision resulted in the loss of around 3,000 soldiers on the Union side and 800 for the Confederates. In the end, the battle proved irrelevant as Sherman again flanked Johnston out of position and forced his army to fall back towards Atlanta. at the crest of the mountain. We started our hike at about 9:30 eastern time from the national park visitors center. The first mile of the trail climbed the side of the mountain to its 1,828 foot summit. Many residents of the area use the trail as part of their exercise routine and we came across many runners and hikers as we walked the trail. We even met three adult scouters who were using the trail to train for their Philmont trip this coming summer. Upon reaching the parking lot near the summit, we found a contingent of U.S. Marines running a group of young men through a rigorous exercise program. One of the Marines told us it was a program for those who aspired to join the Marines. We offered the scouts a chance to join with them but none were keen to volunteer. 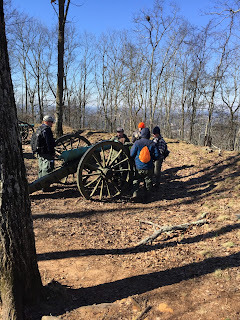 The trail wound over the summit of Kennesaw Mountain, then across the slightly smaller Little Kennesaw Mountain, and down to the rocky top of Pigeon Hill. 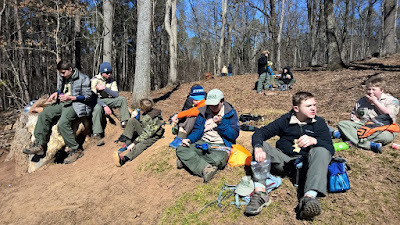 The scouts made use of the big rocks for their rest stop, breaking out their snacks and water bottles for some refreshment and relief after a hard couple of miles on the trail. 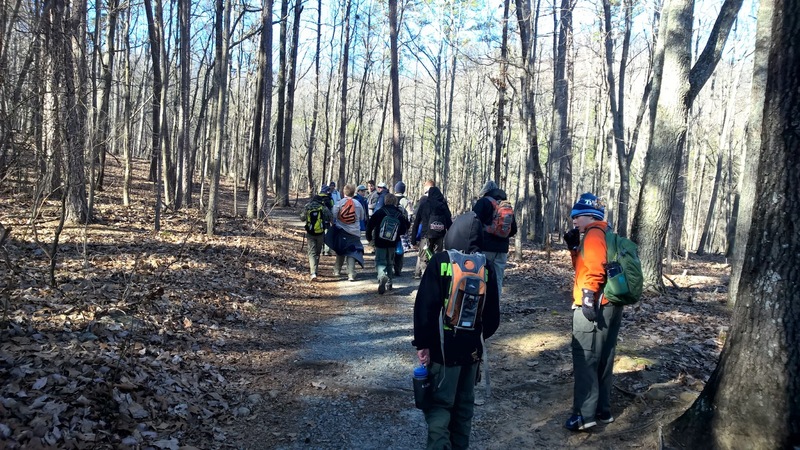 We also started to see numerous youth on the trail who were heading to participate in the monthly workday sponsored by the Kennesaw Mountain Trail Club. The club was started in 2002 in order to keep the trails around the mountain in good shape. Over 101,000 volunteer hours have been worked since the club's founding. The scouts take a rest stop on Pigeon Hill. Louie finds a nice place to nest. 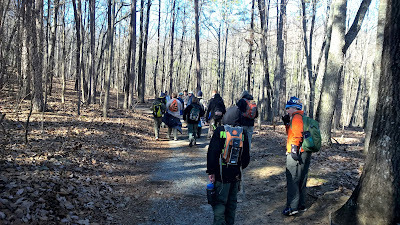 As we continued down the trail towards our designated lunch stop at Cheatham Hill, the temperature began to warm and the physical activity began to warm us up as well. Some of our layers of clothing began to come off and water consumption began to rise. As the morning wore on, Cheatham Hill always seemed to be just over the next hill but alas, it was just a mirage. By the time we finally did arrive, we had covered seven miles of what was intended to be a ten mile hike. Everyone settled into a sunny spot in the grass and broke out their midday victuals from their packs. Nothing like a good sandwich after a multi-mile hike. Following lunch, the scoutmaster (who had been prattling on all morning about the battle) pulled out his copy of Co. Aytch, by Sam Watkins, which is an account of the war written by a private in the First Tennessee Regiment. Watkins' unit had defended an angle in the line along Cheatham Hill during the battle and the fighting had been so vicious that the spot became known as the Dead Angle. There at the place where Watkins had experienced the event, the scoutmaster read from the account describing how a friend and fellow soldier had lost his life by deflecting a bullet meant for Watkins. As he was carried off the battlefield, the soldier asked that all of his gear be given to Watkins. In recounting the episode, Watkins wrote, "he gave his life for me, and everything that he had." The scouts were asked to consider the small sacrifices we make in comparison to a man who gave his own life to save a friend. After some consideration, we headed back to the trail. The hike progresses as the afternoon shadows lengthen. The route back to the visitors center took a trail that skirted the south side of the mountain and thus avoided another climb across the summit. This was fortunate because as the day wore on, the pace of the hikers began to slow and various aches and pains started to manifest themselves (that last part was mostly the adults). By the time we made it back to the visitors center, the hike had begun to resemble an episode of The Walking Dead (without the weapons, of course). According to the GPS, the hike covered exactly twelve miles over the course of six and a half hours. We spent a few minutes in the park store and museum before heading back to our campsite at Red Top. For dinner, both patrols elected to make hobo meals around the campfire. This was a good decision given the falling temperature. Cooking around a nice, warm fire has its advantages. The Leadership Corps and the adult leaders fixed a warm meal of Mexican frijoles, rice, and smoked sausage with a side of corn and toasted bread. It made for a good, hardy meal but seemed to have dirtied every pot and utensil in the chuck box. Washing dishes in freezing weather can be quite a chore. Following dinner, we pulled out a hidden cache of cupcakes and celebrated Ethan's birthday. Everyone joined in singing (or attempted to sing) Happy Birthday. We presented Ethan with a card signed by the troop members and chowed down on the cupcakes. Unsurprisingly, there were none left after a few minutes. A few scouts continued to sit around the fire but for most, the events of the day contributed to an irresistible call by our sleeping bags. In comparison to Friday evening, there was little conversation to be heard among the scouts. The trailer is packed up in preparation for the trip home. The forecast claimed that the temperature dropped to 22 degrees overnight. However, by the morning, most everyone was up and moving, getting breakfast together. The Eagles opted for a hot breakfast of pancakes. Although their aesthetic value may have been questionable, the pancakes proved deliciously filling. It even caused the Mountaineers to doubt their decision not to cook in favor of the tried and true pop tart breakfast. After packing up, our Chaplain's Aide, Aiden, gave us a lesson on the power of words using a book by NFL Hall of Fame coach, Tony Dungy. He noted that words can be encouraging and persuasive but they can also be hurtful and demeaning. Following a prayer for safe travel, we headed to the vehicles for the return trip to the Plains. The acting SPL works to keep the driver alert during the trip home. Monday's PLC meeting was delayed until Thursday by severe weather. At the meeting, the youth leadership gave the trip positive marks for the hike. Those who will be hiking at Philmont in 2017 saw the trail as a good test of our current abilities. The trip was also a good learning experience for cold weather camping (although there was much praise for the "toasty warm" propane heaters) and Ethan's birthday cupcakes received a shout out as well. In areas where improvement is warranted, the PLC saw a need for better planning for the weather, duty rosters, and in cooking. 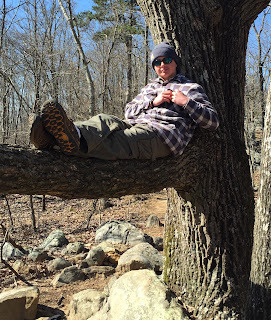 It was noted that newer scouts need more guidance from experienced scouts about what is needed on a hike and what can be left out (apparently, the scoutmaster carried a hardcover book in his pack). As always, these experiences are opportunities for learning and growth. A good test of endurance serves to teach one to go beyond their perceived limits.